Tea time all started at a very young age. I would spend most of my afternoons with my grandparents. We would eat a scrumptious meal at 1, licking my plate clear every time because that is just how amazing my grandmother's food is. By 2 we would get ready for our afternoon nap because the sizzling Bombay sun demanded it. All the shops were closed and there would be no chance to buy anything until 4pm. We would sleep under the fan because it was cozy to feel the cool air. At 3:30, my grandmother would rise and float to the kitchen. I would drowsily wake too, knowing that the promise of sugar was near. She would boil water and add crystal sugar, then milk and finally black tea leaves. I always got to choose a special dainty tea cup from their vast collection, along with a saucer. My grandmother would then bring out the 'biscuits' (cookies) which I gleefully dipped in my few drops of tea. I was too young to be drinking tea, but my grandmother understood that I needed to moisten my cookie with some hot liquid. She did the same and then poured her tea in her saucer and slurped the pipping hot comforting warmth pensively. So tea time is a ritual to be pensive, drink tea and bask in the sugary glory of cookies. It is a beautiful time and requires a serene environment and no clocks. I will not let go of this ritual, it is a part of me. I will wake early in the morning, extra early, so long as I can have my time with tea. My grandmother would make buttery cookies on the stove which she called 'meethi kokie,' which means sweet cookie. She would use white flour, powdered sugar, ghee and milk. My mom got the brilliant idea to use jaggery in the cookie and after that there was no turning back. I would graciously eat my grandmother's original cookie, of course, because anything she touches turns to gold. My version uses spelt flour, salted butter, jaggery and milk. Jaggery or "gur" is a part of my culture. I am unable to define what it really is except that it is a less processed form of sugar and has a molasses deepness to it, along with a caramel flavor. It is divine and worth looking for at your nearest Indian store. There are many many different versions of jaggery - some are made from dates and claimed to be healthier, and some look more golden than others, and some are soft while some are rock hard. This soft one here is from Bombay and is used to sweeten pickles, but we love to use this in our every day cooking as well. These cookies are cooked on the stove because most did not have ovens. I don't see a need to use an oven now because it cooks within five minutes = instant treat. It is chewy, goey and caramely and if you use good butter, just perfect. Please eat with your favorite cup of tea. 1. Preheat a pan (preferably cast-iron) on low heat (medium low for those that don't have a gas stove). 2. In a bowl, rub the butter into the flour until it is oatmealy. Stir in the jaggery, then add the milk. Gently mix. Add more milk, if needed, to moisten enough to bind it comfortably into a ball. 3. Divide into 4. Roll each into a ball and then flatten to a half inch disk. 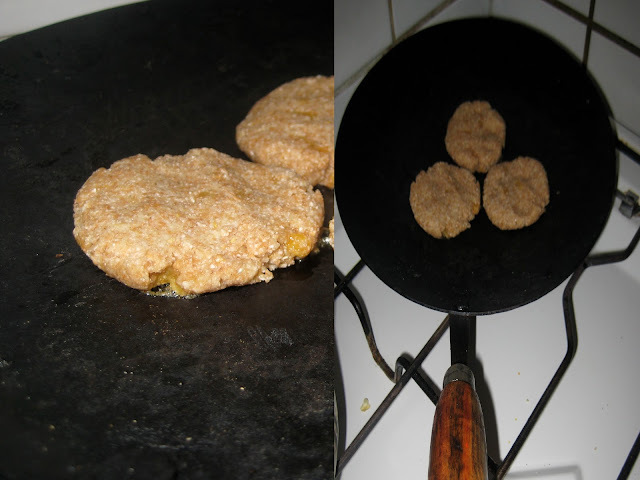 Place onto the pan and after 2 - 3 minutes, when the jaggery has started to melt and the bottoms are golden, flip. Cook for an additional minute or so, until golden on the bottom. Turn off heat and allow the cookies to sit in the pan for 5 - 10 minutes. 4. Enjoy warm or cold with a hot cup of tea.